​A smoker is a perfect investment for your outdoor kitchen or barbecue area. With this handy device, you can prepare a much greater variety of foods and you will be able to spoil friends and family with luxurious meats and veggies that has that charming smoky aroma. 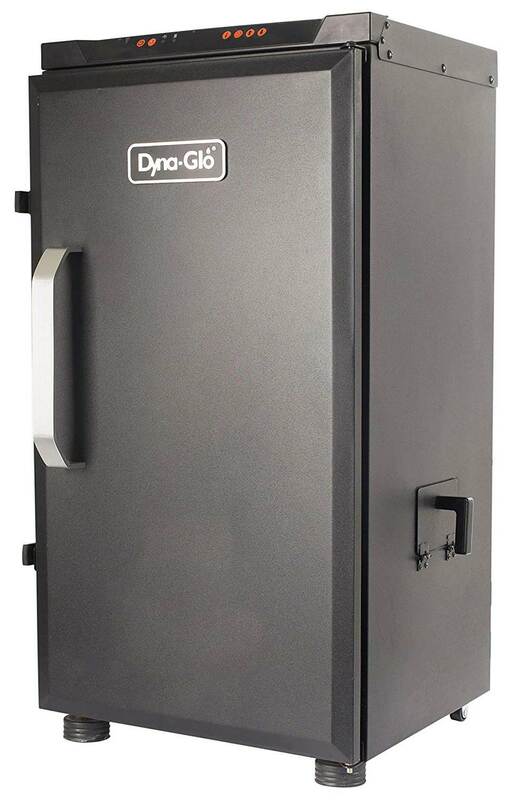 The Dyna-Glo DGU732BDE-D is one of the best outdoor smokers currently available on the market. This 30” digital smoker with its 800-watt burner is ideal for larger families or for restaurant use. The smoker is easy to use thanks to its side wood chip loading system and digitalized top mounted controls. The Dyna-Glo DGU732BDE-D definitely takes the lead in terms of design. It has a sleek, slightly futuristic-looking charcoal matt coating, a large grip handle and the digital controls are installed in a straight bar at the top of the smoker for a seamless control system that doesn’t get in your way. You can utilize the top of the smoker for storage and the simple design of this smoker makes it easy to store in any location. Digital controls – The digital push-button controls enable you to monitor the cooking time and set the temperature easily and you can also display the internal temperature with the push of a button. Wood chip loader – This smoker comes with a side wood chip loading system that minimizes the loss of smoke and temperature while you are preparing foods and that makes it incredibly easy and convenient to reload your smoker whenever wood chips are required. Insulation - The loader is fully insulated with a double wall firebox and a high-temperature door seal that keeps heat and smoked locked inside. Cleaning – This smoker is simple to keep clean thanks to a removable ash and liquids tray and chrome plated grids. Food capacity – The 30” smoker is ideal for larger families or even restaurant use. It has a size of 19.4 x 19 x 32.5 inches and with 732 square inches of food capacity. Weight – At a weight of 62.2 pounds this is one of the heavier smokers but the strong construction that contributes to the excess weight is exactly what makes this smoker ideal for outdoor use. This terrific smoker is ideal for outdoor smoking and is a perfect investment for larger families or small restaurants and diners. It is easy to use, functional, practical, durable and, best of all, it enables you to prepare delicious smoked foods affordable.